Wheelchair Athletics, Inc. & Wheelchair Bodybuilding, Inc.
that it ignites body, mind, and spirit in all he meets! At the age of 16, Nick Scott was an ordinary teenager with an interest in athletics, when a near fatal traffic accident changed life as he knew it... forever. After the accident Nick became overweight and discouraged, but somehow found the determination, mindset and personal strength to transform his life from a debilitating tragedy into a personal triumph. Now he uses those hard-won insights to help others awaken the beast within themselves and achieve their personal goals. As a professional speaker, author, professional bodybuilder, wheelchair ballroom dancer, and personal trainer, Nick Scott uses his enthusiasm, vision, convictions, abilities, and life experience to reach out, to inspire and give hope to others, especially those unaware of the personal strength they can tap into if only they will believe and try. Nick's sheer strength of will has helped transform thousands of individuals - from professional athletes to senior executives - as well as organizations and corporations across the country. Nick inspires others to break through to new levels of peak performance and success. Let Nick Scott Help YOU Achieve YOUR Best Self! In 2007, Nick built and created an online website for helping and training others, NickFitness.com. He is one of the only fitness trainers in the world that has designed workouts specifically for disabled athletes. Many trainers will turn down people in wheelchairs because they are afraid they will hurt or injure themselves, or because they lack the education to deal with someone in a wheelchair. There are many different types of people with disabilities and to others it can be very overwhelming. But for Nick, it is what he knows. Being in a wheelchair for all of his adult life, traveling in a wheelchair and becoming a professional wheelchair bodybuilder has given Nick a unique perspective few others can share. Nick is well educated, his body speaks for itself, and he has the experience to help others accomplish their personal fitness goals. I am just grateful I have a glass." On August 2012, Nick released his first-ever Training DVD - Training Series Volume One: UNLEASH THE BEAST. Viewers are challenged to fill their glass with Nick in an intense 85-minute, in-your-face training session for Back, Chest, Shoulders, Biceps, Triceps & Abs. They are advised not to let the wheelchair fool them, because “THE BEAST” will help unleash their inner strength! Bonus Features include The Nick Scott Story and 2011 IFBB Pro Wheelchair Championships Highlights. BEASTCoaching.com is Nick's online coaching website which has exclusive and in-depth content including his training regimen, diets, supplements, articles, blogs, pictures, videos and more! Plans for this special members-only site include covering a wide range of topics and providing answers to questions that athletes just cannot find anywhere else. Members will receive in-depth instructions on starting their personal journey as they continue to follow Nick on his journey to Unleash The BEAST in all of us. Since March 2006 Nick has competed and guest posed over two hundred and fifty bodybuilding shows around the world. Nick earned his WBFF Pro Card on July 18, 2009 in Atlanta, Georgia. On March 19, 2011 he won the overall title at the 2011 NPC Wheelchair Nationals in Palm Beach Gardens, Florida. In achieving this, Nick finally earned his IFBB Pro Card in wheelchair bodybuilding. Nick is the only wheelchair bodybuilder in the world that holds two different professional wheelchair bodybuilding cards from two bodybuilding organizations. To help others compete in the sport he has come to know and love so well, Nick became founder and owner of the largest online wheelchair bodybuilding community and a global promoter of the sport of wheelchair bodybuilding. Nick's mission is to bring more awareness and exposure to this highly-competitive sport. To accomplish these goals, he intends to lead by example. Wheelchair bodybuilding is Nick's passion and his life, and his goal for this sport comes from his heart. He has promoted the sport in many forms through news stations, newspapers, and major magazines, as well as through motivational-speaking events and stage appearances at countless competitions and events. Nick has traveled across the United States to raise national awareness for and exposure to the sport of wheelchair bodybuilding. On August 16, 2014 Nick took 1st at the 2014 IFBB Dallas Pro in Dallas, Texas. Nick dethroned the Unfeateded Amateur & IFBB Pro Wheelchair Bodybuilder, who was a Pro Bodybuilder before his accident to claim the best IFBB Professional Wheelchair Bodybuilder in the World! As a certified fitness expert, award-winning champion in the wheelchair division of bodybuilding, and two time world power lifting champion, Nick Scott is transforming the world of wheelchair athletics at groundbreaking levels. Through his extensive efforts, and for the very first time in bodybuilding's competitive history, Nick was granted permission to put on the first International Federation of Body Building (IFBB) Pro Wheelchair Division competition. The very first IFBB Pro Wheelchair Championships took place on October 15, 2011 in Houston, Texas at the Houston Pro Show! That night history was made and it was heard around the world! This recognition means that wheelchair bodybuilders who compete at a professional level will now be recognized as such and will be granted their IFBB Professional Status. The IFBB Pro Card is the highest rank a bodybuilder can achieve, and is something to which all professional bodybuilders aspire. Also through Nick’s perseverance and determination, this has become the first time in the world that a professional disabled sport is contested on the same stage as a professional sport. Nick vows to continue building and expanding this sport for the enjoyment and benefit of all professional athletes and is working to raise funds to continue pursuing this dream. Nick Scott is a signed athlete, spokes model, and sponsored athlete or fitness model for multiple companies. He travels the world over representing the name of his sponsors, as well as working at tradeshows of different types. At one of these events, the 2009 Arnold Sports Festival, he was fortunate enough to meet Aubree Marchione, an expert in wheelchair ballroom dancing. In May 2009, Nick charted new territory when he teamed up with Aubree and went on to become the Atlantic Coast Champions and the Heart of America Champions. They soon became the undefeated number one wheelchair ballroom dance couple in the United States. Exactly one year after they met, Nick and Aubree were one of six couples in the world chosen to perform live at the 2010 Arnold Sports Festival for Arnold Schwarzenegger. Nick and Aubree became the first couple in history to represent the U.S. at the World IPC Wheelchair Dance Sport Championships in Hanover, Germany. Nick Scott has been a Professional Speaker for years, but has recently focused more than ever before on pursuing this path to spread his message of self-empowerment and mindset. While driven to bring awareness to the sport of Wheelchair Bodybuilding, Wheelchair Ballroom Dancing, Disabled Sports and support of the disabled community, he is now adding another layer to his speaking capabilities. Leading by his personal example that it is okay to be yourself, regardless of how different or unique you are, Nick is bringing a new path and a more clear vision through his speaking engagements with Business Groups, High Schools, Universities, Corporations, Non-Profits and many other groups and organizations, rather than just targeting the fitness world. Nick believes that he can accomplish more by targeting the main stream on a bigger scale and achieve the same goals, while at the same time touching the hearts of even more people. "Success Is Not A Destination; Success Is The Journey!" For Nick, settling for anything less than his best, giving up or quitting is not an option; it is simply not part of his personal equation for success. In May 2010, Nick Scott’s book "Journey," was published. His personal story is certain to motivate and inspire the masses. It tells the tale of Nick’s Unstoppable Will to Survive after one fatal car ride changed his life forever. Once an avid athlete, a gruesome, tragic car crash left him paralyzed from the waist down and confined to a wheelchair. In the blink of an eye, everything he'd known was turned upside down, and he had to embark on a painful but often uplifting process of rediscovering himself and finding a new purpose for his life. Journey is a candid account of one man's firm grip on hope and his drive to push himself and the people around him to the max. Covering his high school and college years and beyond, Nick shares the intimate details of what it takes to survive a wheelchair-bound life in both the classroom and the weight room. On March 6, at the 2011 Arnold Sports Festival, Nick's movie Perspective - The Nick Scott Story, produced by Aubree Marchione and directed by Robert Nuzzie, won the Best Overall Award at the 1st Annual Arnold Film Festival. Nick took home the crystal "Arny" in the international division, which Arnold Schwarzenegger presented, along with an invitation to visit him on a Hollywood film set. Nick has been a professional model for years working in area such as fitness, commercial, TV and more. With a diverse portfolio and wide range of industry sectors, Nick has universal image that can be merge with multiple brands depending on the company's goals. In 2010 Nick was chosen to be the New Genie for the New Aladdin Slot Machine in casinos all over the world. On October 25th, 2013, Ottawa University proudly awarded, Nick Scott ‘05, with the 2013 Recent Alumni Award. Recent Alumni Award: Established by the Alumni Association in 2013, the Recent Alumni Award recognizes recent graduates who have attained a significant level of achievement and potential for accomplishment. To be considered for the award, candidates must have graduated from Ottawa University within the past ten (10) years and exhibited one or more of the following: met significant challenges; performed service to community, church and others; and/or engaged in significant alumni participation and support. Deeply dedicated to his convictions, in 2008 Nick Scott created and led a wheelchair bodybuilding camp at the Shriners Hospital in Chicago, the first ever of its kind. Teens in wheelchairs from around the country spent one week learning about fitness techniques for strength training and proper performance nutrition, and were introduced to exercise routines they could master. Nick continues to conduct different wheelchair bodybuilding camps and has added wheelchair ballroom dance workshops to expand the camp program. Currently, Nick is working on the most challenging project he has ever faced - opening a chain of 55,000-60,000 square foot non-profit gyms across the U.S. All proceeds will go toward the growth of the non-profit gym and the cause of funding and supporting disabled athletes throughout the U.S., regardless of what sport they want to pursue. Nick is working with a team of professionals on the business plan and plans to secure all donations before the first non-profit gym is set in motion. To many, this may seem impossible, but to Nick, he will do what it takes to make it a reality. "Einstein never said he was smarter than anyone, he just stuck to the problem longer"
Serve as a positive role model for people facing challenges. Become a leader in the disabled community who helps others turn disabilities into possABILITIES. 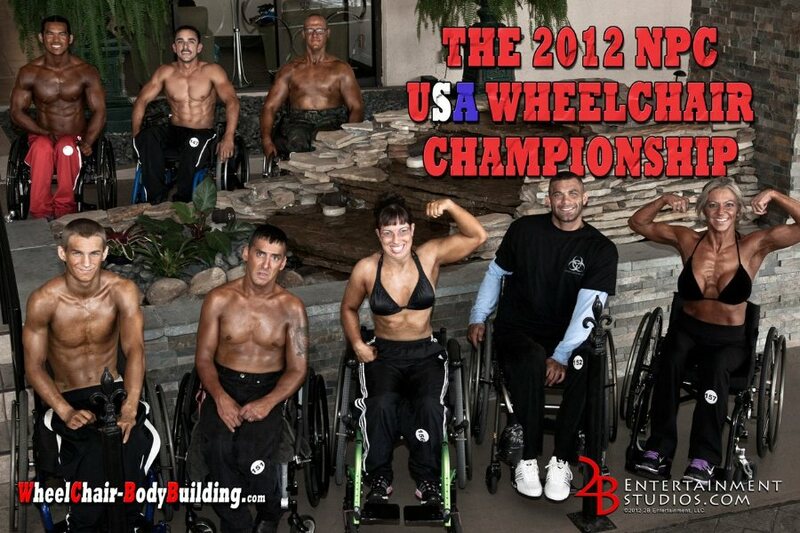 Promote the sport of wheelchair bodybuilding and motivate all athletes to achieve their maximum capabilities. Raise funding to open a chain of non-profit gymnasiums. and geared to empower and inspire teenagers led to his appointment. film debut won the Crystal 'Arny' and the film won the Best Overall Award. IPC Wheelchair Dance Championships in Hanover, Germany. the power inside everyone. Unleashing that power of “The Beast” is a goal anyone can achieve. CEO/President/Founder - Wheelchair Athletics, Inc.
the opportunity to experience athletics. Spokes model for Morph Wheels, the first foldable wheelchair wheel. Nick also appears in print, internet and television advertisements as spokesperson for fitness clients. techniques and solutions to help clients achieve maximum results and peak performance. Nick promotes this sport by using a high level of communication, social and networking skills. and travels across the United States to bring more awareness and exposure to it. trainers in the world that has designed workouts specifically for disabled athletes. executives - as well as organizations and corporations across the country. activities open to any child, adult, or veteran with a disability. Champions, as well as the undefeated number one wheelchair ballroom dance couple in the U.S. Wheelchair Dance Sport Championships in Hanover, Germany. Annual Arnold Film Festival in 2011.
professional disabled sport was contested on the same stage as a professional sport. back, chest, shoulders, biceps, triceps and abs. for the Abilities Expo, which is specifically geared towards the disabled community. convictions, abilities, and experiences to reach out, inspire, and give others hope for a better life. expert relationship building, change management and process improvement. management, he champions performance excellence through quality leadership. United States Representative for the World Paralympic DanceSport Championships - 1st United States Representatives in the Championships held in Germany. *1st Wheelchair Mixed Pair in Bodybuilding History! As a professional speaker, author, professional bodybuilder, wheelchair ballroom dancer, personal trainer, and entertainer, Nick Scott has the enthusiasm, vision, convictions, abilities, and life experiences to reach out, inspire and give hope to others, especially those unaware of the personal strength they can tap into once they begin to believe and try. His sheer strength of will has already helped transform thousands of individuals - from professional athletes to senior executives - as well as organizations and corporations across the country. Nick inspires others to break through to new levels of peak performance and success. Nick utilizes the strengths of his own education and experiences to drive home each client's goals through personal, customized and unique speeches. He instills a "can do" spirit in all participants by giving them the confidence and independence they need to face their own life challenges and overcome barriers which might previously have seemed insurmountable. Nick's mission is to inspire and motivate all those he meets, and to improve the quality of their lives by breaking stereotypes, shifting their thinking, and smashing the bonds of negativity that keep us paralyzed from achieving what we want out of life. It is Nick's goal to continually strive for a higher level of expectation. He embarks on each speaking engagement with the goal of delivering a powerful and memorable performance for all those in attendance. His lessons and insights are not meant to expire at the door, but to resonate with the audience long after they leave. The result of his emotional and impactful delivery is that he usually promotes real change within the lives of audience members and incites them to further action through independent research and incorporation of his lessons into their individual life situations. Over time Nick has encouraged, and expects that, many of his audience members may reach out to him afterwards, providing him with gratitude and updating him on how their lives have improved following his presentation. For Nick, motivational speaking has moved past being just a career and turned into a lifelong passion. Over the years he has helped many others, and in his heart he knows it is what he has been chosen to do. Certified fitness trainer, specialist in performance nutrition, and an award-winning champion in the wheelchair division of bodybuilding, two-time world power lifting champion, part of the #1 USA wheelchair ballroom dance couple, Nick is transforming wheelchair bodybuilding at groundbreaking levels. Through Nick's extensive efforts, for the very first time in bodybuilding's competitive history, Nick Scott was granted permission to put on the first International Federation of Body Building (IFBB) Pro Wheelchair Division whereby wheelchair bodybuilders who compete at a professional level will be recognized as such and granted their IFBB Professional Status; the IFBB Pro Card being the highest rank a bodybuilder can achieve. What's even more amazing, it will be the first time in the world that a professional disabled sport will be on the same stage as a professional sport. Nick has competed and guest posed at 250+ times bodybuilding shows all around the world since March 2006, and on March 19, 2011 won the overall title at the 2011 Wheelchair Nationals in Palm Beach Gardens, Florida. In achieving this, Nick finally earned his IFBB Pro Card in wheelchair bodybuilding. Nick earned his WBFF Pro Card on July 18, 2009 in Atlanta, Georgia. Nick is the only wheelchair bodybuilder in the world that holds two different professional wheelchair bodybuilding cards from two bodybuilding organizations. Wheelchair Bodybuilding, Inc. (WCBB) was originally founded as Wheelchair-Bodybuilding.com in May 2006 by IFBB professional wheelchair bodybuilder Nick Scott. After nearly dying and becoming disabled in an automobile accident at the age of only 16, Nick initially felt sad, depressed and alone. Once he stopped feeling sorry for himself, he started focusing on what he could still do, which was to be stronger than everybody else. Since he had been an athlete before the accident, Nick soon returned to the one place where he had experienced confidence and success - the weight room. Because there was very little help available for the wheelchair athlete at that time, Nick often had to devise his own workout regimens to accommodate what his body was capable of achieving. As he started to lose weight, gain definition, and build confidence he decided to challenge himself to become a professional wheelchair bodybuilder. He eventually met that goal by earning an IFBB Pro Card and went on to achieve much more, becoming a professional wheelchair ballroom dancer, certified fitness trainer, specialist in performance nutrition, speaker, signed athlete and fitness model, and author. After seeing what changes wheelchair bodybuilding had brought about in his life, Nick dedicated himself to helping others in similar situations to “unleash the beast” and awaken the fire within to achieve their own life goals. As there was nothing available to help wheelchair athletes learn about workout routines, fitness supplements and professional competitions, he set out to establish an online community where these athletes could communicate with and motivate each other. ​If We Can Do It, So Can You! As founder, president and CEO of Wheelchair Bodybuilding, Inc. Nick worked hard to build recognition and awareness for the sport that helped him accomplish so much. He watched with pride as his dream has grown into the largest online wheelchair bodybuilding community. WCBB focuses on promoting, growing, and expanding the sport of wheelchair bodybuilding. Through its association with the IFBB (International Federation of Bodybuilders), wheelchair bodybuilding is the only sport in the world for the disabled community that is recognized as a professional sport. With Nick’s vision and the support of many people in the professional bodybuilding community, the first IFBB Professional Wheelchair Championships took place at the 2011 IFBB Houston Pro Show on October 13, 2011. There are now over 1200 wheelchair bodybuilders who are working hard to meet their own goals and set an example for others of what can be achieved with persistence and a positive mindset. The next step is to have an IFBB Pro Wheelchair Division added to the Arnold Classic and Olympia Stage. The ultimate dream for any athlete in the fitness industry is to compete on those two stages, and Nick wants to help make this dream come true for as many athletes as possible. To achieve this goal, professional wheelchair bodybuilding needs to hold more IFBB Pro Wheelchair Shows each year and attract more wheelchair bodybuilders to the sport. Nick hopes to use WCBB to attract even more wheelchair athletes to the sport of bodybuilding and provide the training insights and motivational support necessary to help as many wheelchair warriors as possible compete professionally on the world stage. ​Wheelchair Bodybuilding, Inc. is part of the Wheelchair Athletics Foundation (WCA), a 501(c)(3) non-profit organization dedicated to raising funds to expand and improve opportunities for wheelchair athletes in all sports. The WCA is a national organization that was founded on December 23, 2008 by Nick Scott and approved as a 501(c)(3) organization on February 11, 2010 under the legal name of Wheelchair Athletics, Inc. The Ultimate goal of the Wheelchair Athletics Foundation is to open a chain of 100% non-profit gym facilities designed to support disabled athletes and provide special rehabilitation programs. All proceeds from these facilities will go toward the operations of the gym, expanding and opening new non-profit gyms, and promoting the cause of supporting and funding disabled athletes. The purpose of WCA is to provide and support the Wheelchair Athletics experience through activities that are open to any child, adult, or veteran with a disability, with the hope of providing both physical and psychological therapeutic value to that person. Wheelchair Athletics Foundation hopes to instill a “can do” spirit in all of its participants by giving them the confidence and independence they need to face their own life challenges and overcome barriers which might previously have seemed insurmountable. Nick Scott & Aubree Marchione Flash Mob Dance for the Push Girls!